Age of Unit : Unknown but presumed to be over a thousand years old. Height : Variable from human child to Gigantic Guyver size. Status : Former agent of Chronos now a renegade aligned with Dreadnought. Description: The subject is a prototype sentient Guyver unit that escaped from the Gen during their attack on the home world of the Guyver XT9. The subject masqueraded as something similar to a Gigantic Cocoon and then tricked the Guyver XT9 into thinking it was his sister. Ultimately letting him bring it to Earth where it then merged with a young female host and became a hybrid of the two life forms. Discovered during a battle with an abandoned Kavzar, the alien being assisted Chronos in that battle and had since decided to join our ranks because of our mutual goal to have revenge against the Gen. Unlike Guyver XT9 who actively shared information with Chronos about how dangerous the Gen and their wider Kavzar Army are Zygote Guyver shared no information at all only aiding in battle when it suited her against other Guyvers. After a battle with Chronos own forces in Russia Alkanphel began to no longer see her as a useful ally. This lead to using her in a battle against Dreadnought during the Seven Days battle. Dreadnought defeated her with relative ease but then unexpectedly showed her mercy. Zygote Guyver has since left Chronos and has joined Dreadnought's break away fraction and now resides in New Cork Texas. -Physical Strength: Unlike a normal Guyver, the host and unit of this being have been completely merged into a new hybrid life form and consequently has abilities far beyond the norm for a Guyver. Though the subjects maximum strength level may vary according to what physical form this shape shifting being decides to take on, the maximum recorded level demonstrated by this being is equal to that of 1000 men. Stamina of this being is also greater than normal and can fight continuously for several hours before tiring. Though subject can supplement its bio-energy reserves by literally eating other living beings by absorbing them into herself in a manner similar to the Rogue Lost Unit Aptom. -Durability: Also variable according to physical form this being decides to take on. So ranges from a human norm to five times that of a Gigantic Guyver. Rate of regeneration in all forms is 1000 times that of a normal Guyver. -Gravity Control Orb: Appears same as a standard unit but due to subjects high power level and combined with three Zoalord like bio-crystals, grants subject near Elite Zoalord level gravitational powers. Allowing subject to fire a pressure cannon with as much destructive power as a standard Guyvers full double Mega Smash, as well as Zoalord type Black Hole and gravity bullet attacks. -Head Beam: Same as a standard Units but subjects high power level allows for it to have an energy output ten times that of a normal Guyver. -Mega Smashers: Are similar to a standard Guyvers but power output has been observed ranging from that of a normal Guyver power level to a level near similar to that of a Gigantic Guyvers Hyper Smashers. Though subject is powerful enough to use this weapon repeatedly, using them at maximum power puts a serious drain on subjects bio-energy reserves and can only be used two to three times before subject exhausts herself. Unless subject supplements her bio-energy reserves by eating another living being. -Hyper Sensors: Are more powerful than normal and have a range of 1610 meters (~1 Mile). Subjects other sensory perceptive ranges are also far beyond the norm for a human. -Vibrational Swords: Swords appear to be the same as a standard Units but subjects shape shifting ability allows it to change the swords shape as easily as the Warrior Guyvers polymorphic swords and combined with subjects high power level, makes them a near match for the Warrior Guyvers swords. -Sonic Busters: Subject doesn't appear to have the standard emitter orbs but can project a sonic blast from any part of her body and can even create a sound shield barrier capable of shielding subject from almost any physical attack. -Control Medal: Subjects Control Medal appears to be the same as a standard Unit but has been modified to maximize Units power output, essentially increasing units efficiency to that of a Gigantic Units but in the process, the innate consciousness of the Guyver organism was freed and the Unit self activated and escaped from the Gen. Needing to bond to another life form to achieve its full power, the Unit absorbed a young human female it encountered soon after arriving on Earth. The resulting Guyver/human hybrid, combined with the advance power management of the Units experimental CM has granted subject ten times the normal power of a normal human bonded Guyver. 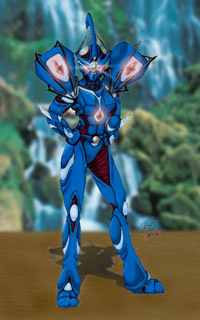 -Psionic Powers: Subject appears to have the standard Guyver ability to telepathically communicate with other Guyvers. -Other: Subjects hybrid human/Guyver DNA allows subject to shape shift at will. The subject can also shift part of its mass into hyper space so can take shapes of significantly different sizes ranging from a small human child to the massive form of a Gigantic Guyver. The subject can also use this ability to teleport at will. 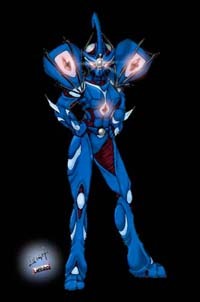 The subject is also equipped with Zoalord like bio-crystals that it can use to create Gigantic Guyver type energy shields, focus and boost its gravitational powers to the level of a Zoalord, and combined with subjects shape shifting ability to cloak itself. Even without the use of these bio-crystals, the subject can blend into its environment like a chameleon. No other conclusions of this Unit abilities can be confirmed until further data is gathered.